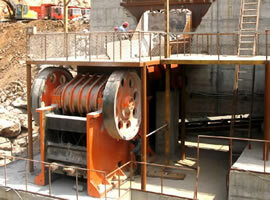 Impact crusher can deal with a wide variety of raw materials such as granite, limestone, basalt and gypsum. Nearly all the mineral materials whose size is less than 500mm and compressive strength is not exceeding 320 Mpa can be broken by mining impact crusher. Through constant development, now the mineral impact crusher has a broad use in high-grade highways, water and electricity, artificial sand-making, stone reduction and construction industries. 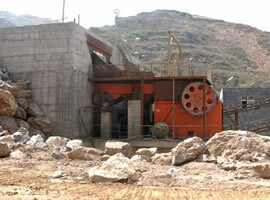 During the advancing course, it is an important progress for our crusher industry to adhere to technology innovation and strive to break away from the simplex technique introduction and imitation. Over the past several years, we have been engaged in studying and improving impact crusher's structure, in order to promote its crushing result on hard rocks and ores. In addition, our company has changed the modified the plate hammer, conductive to improving the structure of rotor and plate hammer and increasing its crushing ratio and utilization rate. As the economy continues to make progresses, the demand for crushing equipment in our country also grows quickly. The sharply increasing demand for sand and stone materials makes the ordinary impact crusher unable to satisfy the wide customers' demand. To be a professional impact crusher manufacturer, the mineral impact crusher manufactured by our company has a high automation degree, drastically lightening workers' labor intensity and raising the production efficiency. In addition to these, to meet the ever-rising requirement of the market and customers, our mineral impact crusher steps into a standardized and scaled production.